Confidence must be sky high within the Hibs squad after yet another magnificent week. The win over Hearts on Tuesday was massive for everyone connected with the club. I think it was even more significant because of the way we came back from the dead in the first game. We thoroughly deserved to win the replay. Hearts only really turned up with about 20 minutes to go but, up until then, we looked reasonably comfortable. It was another great experience for our younger players to come through, and that bodes well for the big cup games next month. Players always want to play in big games and we’ve got plenty of those coming up. The fact we’re doing well in the cups is likely to help give our league campaign a boost because every player will want to be involved in every game. Anyone that comes in knows they need to take their chance, and we saw an example of that against Alloa yesterday when Martin Boyle and Danny Carmichael came in and grabbed the goals. There’s always a danger that the team might be a bit flat after a big game like Tuesday’s, so it was important that we were able to freshen things up yesterday. I was surprised we made as many as seven changes, but it’s great that we were able to do that and still put out a team that was strong on paper and able to get the job done in comfortable fashion. With the games continuing to come thick and fast, Alan Stubbs is going to have to keep utilising the full squad, but he’s done a really good job of managing the situation so far. 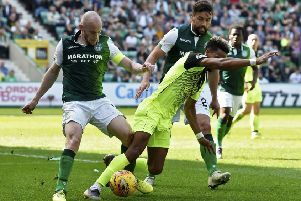 We’ve kept the pressure on Rangers and, although they also won yesterday, I think Hibs will take some heart from the fact they’ve lost their main attacker, Martyn Waghorn, to injury. Taking him out of their team is the equivalent of us losing Jason Cummings, so I’d be surprised if Rangers don’t suffer at some point without him. If we do come up short in the title race, though, I think we’d have to fancy our chances in the play-offs. We’ve shown so many times this season that we can handle the big occasion and I think we’d be far better equipped to deal with the play-offs than we were last season.